The 2019 Application period is now completely CLOSED. The 2020 Application period will open in early January 2020. 2020 Applications will be open to candidates born in the year 2006 or later, whose families meet the after-tax Low-Income Cut-Off (LICO). We are unable to provide any updates for completed 2019 applications until the decisions have been made in October 2019. Welcome to Smiles 4 Canada! A smile is a very powerful thing. Unfortunately, many young people have dental problems that make them self-conscious and stop them from smiling. Many of these problems can be corrected with orthodontic treatment, but not every family has the financial resources to afford orthodontic treatment. 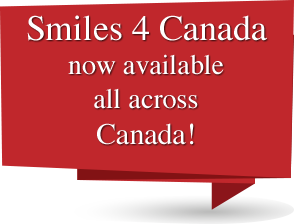 Smiles 4 Canada is a program run by the Canadian Foundation for the Advancement of Orthodontics (CFAO) in conjunction with the Canadian Association of Orthodontists (CAO). The program facilitates the orthodontic treatment of deserving young Canadians who would otherwise not be able to afford treatment. Applicants to the program must be under 14 years old (18 in Manitoba). Patients who are accepted for treatment through the program will be treated by a local participating orthodontist. Patients’ families are only required to pay a small administrative fee, generally less than 10% of a complete course of treatment. What could your child do with a smile? Interested? Check our Patient FAQ for more information on how to apply. What are Your Responsibilities as a Patient?